This ladybugs and daisies cake is a 10 inch round with an 8 inch round stacked. The cakes were covered in rolled buttercream. A few days ahead I made the smaller flower using royal icing and a tip 2D with tip 4 centers. The large daisies were made with gumpaste using a large daisy cutter. I ruffled the edges of those flowers using a ball tool. The centers are made with royal icing and a tip 8. The bow was also cut from gumpaste and formed over paper towels until it dried. The sign was also cut from gumpaste and allowed to dry. I wrote the message using edible ink markers. The sign was attached to a sucker stick using piping gel and then inserted into the cake. 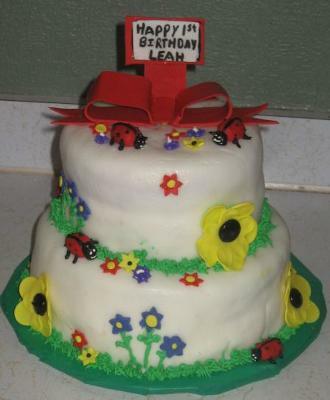 The ladybugs were free formed by hand out of marshmallow fondant with details using royal icing. I used a grass tip for the borders and the leaf tip for the stems and leaves. "LadyBugs: Oh So Sweet 19"" Pinata"
WOW! VERY PRETTY! GREAT JOB!